EveryMatrix N.V., which is the managing company, has been in the e-gaming industry since 2008. There are over 1,000 releases to choose from, and all cohorts are represented. Live content is available for quality gaming. There are releases from Net Entertainment, Microgaming and Play’n GO, just to name a few. Deposits and withdrawals can be processed in a variety of currencies, including not only major ones often found at online casinos. Among them are welcome deals and weekly promotions. 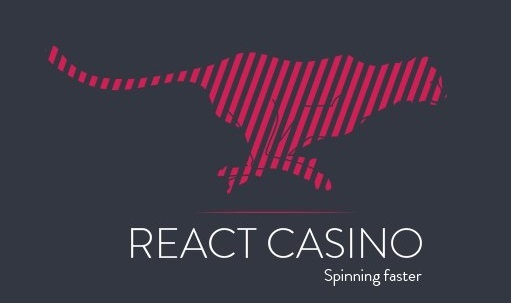 Established in 2017, React Casino is authorized by two popular and solid institutions. The first one if the jurisdiction of Curacao, which allows a broad range of countries to be accepted. The second one is the Malta Gaming Authority, which is considered one of the top two licensees to trust. The owner of this new gaming destination is EveryMatrix N.V. – a frequent guest of our reviews due to its active presence in the industry and a big network of titles. Among some of its creations, which have already been evaluated by our team, are PlayHippo, Caribic, Spinson, Jetbull, Viks and a few more. The reviewed operator is available only in English, and statistically, most of the visits are paid by the Romanian residents. This audience can also check our special post devoted to online gambling for Romania, including legal aspects and a list of places where players can receive decent services. As to React, all of its content is provided in the instant play mode for a variety of desktop systems – from Windows to Mac. Portable wagering is possible, as well, due to the instant play adaptation, which can be launched on different smartphones and tablets that utilize Android or iOS. Demo mode is provided, but to win real money, one must have a login. It is also the condition for claiming generous bonuses. The sign-up procedure is available for all of our readers who can click the big green “Visit” button and continue at the website. The process of becoming a member is simple and takes only one short form to complete. The minimum deposit is 10 Euros, or the equivalent in British pounds and US dollars. These are not the only three currencies accepted by the cashier, and the selection is actually quite broad, covering the needs of users from most continents. Thus, financial transactions are allowed in Australian and Canadian dollars, Swiss francs, Chinese yuan, Czech koruna, Danish and Norwegian krone, Swedish krona, Georgian lari, Hungarian forint, Croatian kuna, South Korean won, Mexican peso, Polish zloty, Nigerian naira, Romanian lei, Russian ruble, Peruvian sol, Turkish lira, Venezuelan bolivar, and South African rand. Banking can be done in a number of ways – from e-wallets and prepaid vouchers to cards and bank transfer. Thus, electronic wallets are represented by Neteller, and prepaid options – by the Paysafecard and Neosuf. Among credit and debit cards Visa, Maestro, MasterCard and EntroPay are proposed. Canadians are free to pay by iDebit. There are Trustly and Euteller for Scandinavian countries, German GiroPay, Australian PoLi, and EPS for Austria. The speed of payouts stated on the website is one business day, but some winners have left feedback that it took them up to four days to receive their money. It just so happens that neither of the influential portals that we usually monitor for a comparative opinion has had a chance to review this place to bet and win yet. The same goes to the feedback from the register customers – thus far, the amount of responses is not sufficient enough to draw any conclusions. We will monitor the situation and keep our players updated. Meanwhile, those wondering how to contact the help desk with questions or suggestions can either write an e-mail, to which the representatives should reply within no more than 24 hours, or there is also the live chat form. Its staff works all week long from 7 am to 11 pm. The non-biased third-party conflict resolver is Licensor. Promo Codes: No special codes are needed, as all promotions will be added to the account automatically if the deposit limits meet the requirements. Free Spins Availability: This offer can be either a sign-up deal, or a standalone promotion. Game Contribution: Slot machines count up to 100% towards the rollover terms, while table games and video poker games do not contribute at all. Cashable: Before requesting a bonus amount for cash-out, its play-through requirements should be met. All newbies can count on a welcome offer, which can be occasionally modified. Thus, currently the proposition is up to 1,000 free spins, and the final number of bonus rotations is determined by the amount deposited. Adding under 300 Euros to the account can bring anywhere from 20 to 100 rolls. If 300 Euros or more is deposited, the advertised 1,000 spins can be expected. Wins from the promotion should be wagered 30x. The welcome can be changed by the React team. Among other offers are weekly reloads up to 50%, which have to be played through 40xBD, unless claimed by clients from Moldova and Sweden. The rollover terms for these two countries are 45xBD. All who deposit and bet actively will easily accumulate loyalty points. Here they are called frequent player points. These rewards can be exchanged for cash. The library provides over 1,200 releases from a variety of software developers. Among them are Net Entertainment, Microgaming, Quickspin, Old Skool Studios, and Play’n GO. All game cohorts are represented, and all content is divided between two lobbies – for RNG and live entertainment. The first lobby is categorized by video and classic reeled machines, table games, video poker, scratch cards, jackpots, new releases and other games. Among popular video slot releases are Merry Xmas and Pimped by Play’n GO, Victorious and Creature from the Black Lagoon by Net Entertainment, Forbidden Throne and Fortune Girl by Microgaming, and La Rouge by Old Skool Studios, just to name a few. Among classic slots are plenty of fruit and three reeled machines, and major wins can be received from spinning such progressive games as Gunslinger by Play’n GO, and more. Among video poker games are plenty of choices, including Jacks or Better, Double Double Bonus, Triple Double Bonus, All American, and more. The list of table games covers European, Multi-Player, French, American, 3D and several other roulette variations, baccarat, Hold’em, craps, Sic Bo and plenty of blackjack types – Lucky Lucky, Double Xposure, Mini, Single Deck, Perfect Pairs, and more. Live lobby represents entertainment by Evolution Gaming, Net Entertainment, XPro Gaming, and Authentic. All games are represented, and there are variations per each of them – roulette, baccarat, blackjack, and table pokers.